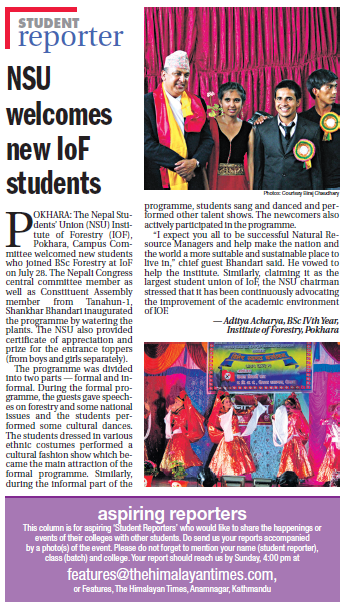 The Nepal Students’ Union (NSU) Institute of Forestry (IOF), Pokhara, Campus Committee welcomed new students who joined BSc Forestry at IoF on July 28. The Nepali Congress central committee member as well as Constituent Assembly member from Tanahun-1, Shankhar Bhandari inaugurated the programme by watering the plants. The NSU also provided certificate of appreciation and prize for the entrance topers (from boys and girls separately). The programme was divided into two parts — formal and informal. During the formal programme, the guests gave speeches on forestry and some national issues and the students performed some cultural dances. The students dressed in various ethnic costumes performed a cultural fashion show which became the main attraction of the formal programme. Similarly, during the informal part of the programme, students sang and danced and performed other talent shows. The newcomers also actively participated in the programme. “I expect you all to be successful Natural Resource Managers and help make the nation and the world a more suitable and sustainable place to live in,” chief guest Bhandari said. He vowed to help the institute. Similarly, claiming it as the largest student union of IoF, the NSU chairman stressed that it has been continuously advocating the improvement of the academic environment of IOF. The Institute of Forestry (IoF), Pokhara Campus organized a two-week field training program for the B.Sc. 4th year, 1st semester students from June 21. Eighty students from the batch participated in the program. Different community forests and collaborative forests of Rupandehi and Kapilvastu district were fixed as the field training sites for the different group of students. The main aim of the program was to teach the students about different forest management practices at the field level. The students compared the scientific forest management practices and conventional forest management practices in different forests. They learned the techniques of boundary survey of forest area using GPS (Global Positioning System), mapping of the forest and its sampling using GIS (Geographic Information System) software, comparison of the regeneration status between scientifically managed and unmanaged forests, calculation of Annual Allowable Harvest (AAH) from a particular forest, tree tagging and stem mapping procedures. With help from forest officers and field technicians of the corresponding districts, the students prepared scientific management plans of some community forests and collaborative forests. They learned that Tilaurakot Collaborative Forest is the first forest managed under Scientific Forest Management Plan in Nepal. They presented their work among the forest users and forest officers at the final day of the program. With an aim to gain practical knowledge about forests and implement the new practices and technologies in the local level, the Institute of Forestry (IoF), Pokhara organized a tour from November 19 for the students for the students studying in BSc IIIrd year at IoF. Eighty students participated in the tour that lasted two weeks through the western region of Nepal and at the Forest Research Institute (FRI), Dehradun, India. During the tour, students observed the scientific management of forest at Lumbini Collaborative Forest and park management systems in Bardiya National Park and Shuklaphanta Wildlife Reserve. Student enjoyed jungle safari too in the Bardiya National Park. The students learned that Bardiya National Park is the largest protected area in the terai region with an area of 968 sq-km providing habitat for 50 Bengal Tigers (Panthera tigris tigris ). The students also got a chance to visit the Century Pulp and Paper Industry at Haldwani and Wildlife Institute of India (WII) at Dehradun. Other sites they visited were Eucalyptus and Poplar plantation sites and agroforestry farms around Haldwani, forest nurseries in Haldwani and FRI and various forest museums and divisions in FRI.